What Is DA Form 4126? 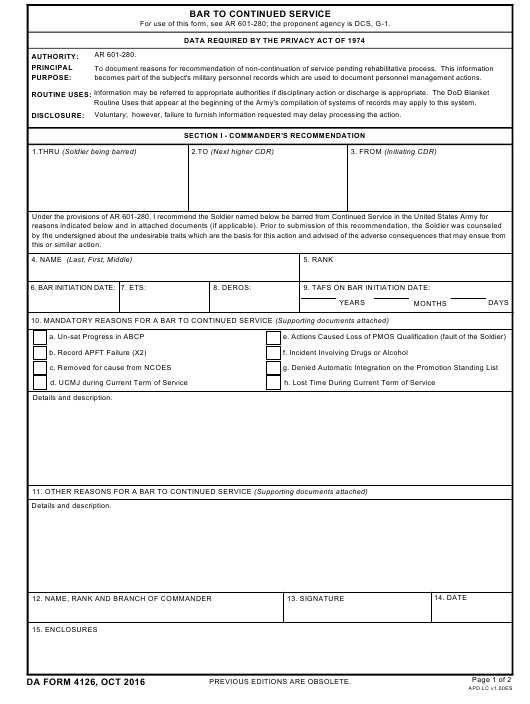 DA Form 4126, Bar to Continued Service is a form that is used to document reasons for a recommendation to discontinue further service in the U.S. Army. The newest edition of the document - sometimes incorrectly referred to as the DD Form 4126 - was released in October 2016 by the Department of the Army (DA). An up-to-date DA Form 4126 fillable version is available for download and filing below or can be found through the APD website. showing no interest in promotion. How To Fill Out Da Form 4126? For use of this form, see AR 601-280; the proponent agency is DCS, G-1. becomes part of the subject's military personnel records which are used to document personnel management actions. Routine Uses that appear at the beginning of the Army's compilation of systems of records may apply to this system. Voluntary; however, failure to furnish information requested may delay processing the action. 16. I understand that by placing my initials on the line by the statement below I am confirming the action to be true and complete. I have been counseled and advised of the basis for this action. I have been furnished a copy of my Commander's recommendation (Section 1) to bar me from Continued Service. DO NOT desire to submit a statement in my own behalf (use a continuation sheet if required). 21. I have reviewed Sections I and II and all factual and relevant information (enclosures). Recommend Approval of the Bar to Continued Service. The Bar Certificate is Disapproved. The Bar Certificate is Approved. 26. You understand, if you fail to make progress you may be subject to involuntary separation. b. I will not appeal the Bar to Continued Service. a. I will appeal the Bar to Continued Service. Section I contains the commander's recommendation. First, the commander has to provide the name of the barred soldier, the name of the next higher CDR and the name of initiating CDR - their own. The form then requires the full name of the soldier once again along with their rank, DEROS and ETS, the date of bar initiation and the total active federal service dates. The reasons for the bar (Item 10) must be proven with attached supporting documents. Section II - Soldier's Review - is filled in by the barred service member. They must confirm that all presented allegations are truthful. If the soldier disagrees, they can submit a statement on their own behalf in accordance with the AR 600-37. The soldier receives a copy of the form with a 7-day period to prepare their comments and collect papers to support their statements. An extension of the period can be granted if the initiating commander believes it to be necessary. If the Soldier showed no desire to make a statement, the bar will be processed immediately. Section III is filed by the next higher command. After they review the bar, they must provide their approval or disapproval it in this section. Section IV is for the information on counseling by the initiating commander. This section confirms the approval or disapproval of the DA 4126 and whether the soldier will appeal the bar or not. This section requires the initiating commander's and the soldiers' full names, ranks, signatures, and dates of filing.